I’ve been preparing for this singlehanded cruise up the coast of downeast Maine for a year now, and the departure date has finally arrived. I’m leaving aboard Chip Ahoy on Tuesday and will be away for the month of August. I expect to be back home by Labor Day Weekend, when I’ll have much to report I expect and many new photos of the adventure to post. My plan is to sail up the coast of Maine ideally up to the South Addison and Jonesport area, just south of Machias, to visit my old friend Monica -- time and weather permitting, and depending upon my ambition -- but I’ll just take the trip one day at a time, enjoy myself. 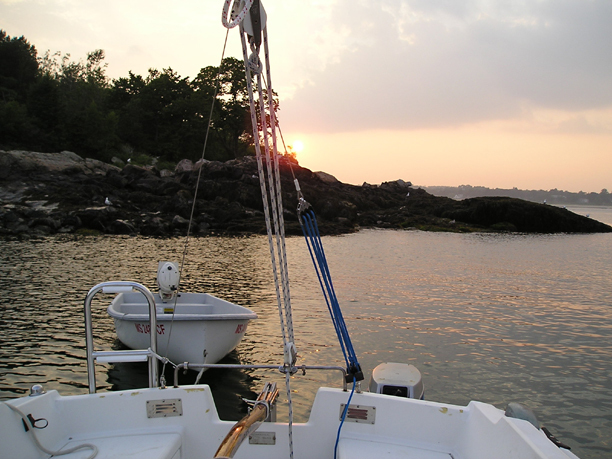 I’ll sail north then east for two weeks, then turn around wherever I find myself and head back to Marblehead. Today I’ve got a few more tweaks to do to Chip Ahoy (add mast gates, install an oil lamp in the cabin, calibrate the new tiller-pilot, etc. ), then I can begin loading the boat in earnest for casting off on Tuesday. Wednesday, August 4, 2004: 0630 hrs. Getting off yesterday according to plan didn’t work: one thing after another came up, putting my planned early departure off. After using my computer and Garmin’s MapSource and Blue Charts to plot my course to Portland, Maine and upload it to my two GPS units, I realized just how much easier it was to do on a computer, instead of poking at buttons through the alpha-numerics of the GPS. Barbara suggested that I take her laptop (which I’d already decided not to bother with) and I concurred if for no other reason than to make navigation so much easier. It took a couple hours to load the software onto the laptop and recharge its battery. I took the two 5 gallon jugs down to the dock and filled them with water, intending to take them out to Chip Ahoy. When I went to load them in the dinghy, I found that I couldn’t spin the dial on its combination lock, couldn’t release it from the dock. I took the launch out and back, then returned home for some tools to force the lock. Two trips later, I finally broke the lock and released Chip Mate, the dinghy. By then it was 1:30 pm and my early morning departure was history, so I decided to get off my mooring anyway, away from land and distractions, and cruise out to Great Misery Island for the night: get an early start the next morning... and here I am in a calm and peaceful anchorage with one other sailboat moored in here with me overnight. I slipped off my mooring in Marblehead at 3:00 pm. 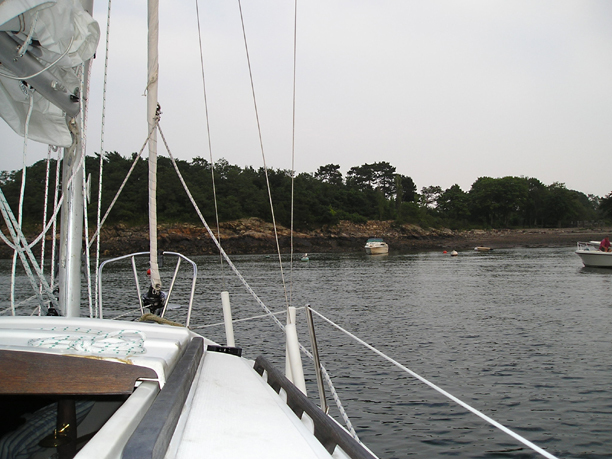 The mooring I “borrowed” for the night was pretty close to the rocky shore and I arrived with an outgoing tide that still had about six feet to drop. Very close to shore, I was nonetheless in 17 feet of water and felt alright about it – though I kept watch on the ever-nearing rocks as the tide fell. Low tide at about 7:00 pm still left me with space and water. I ate the sandwich I’d brought along for dinner, read for a while under the new oil-lamp, and called it a day by around 9:00 pm. It’s sunny/partly cloudy, in the high-60s with a slight breeze that’s supposed to pick up to N at 10 mph later in the morning, later turning east. The first onboard coffee of the year is brewing on the alcohol stove out in the cockpit and I’m ready for a fine day of sailing, hoping with some tacking until the wind direction changes to reach Newburyport by the end of today. Thursday (tomorrow) is supposed to be mostly rain, sometimes heavy, so I may sit the day out if I can make it there today. I got an early start yesterday as planned, leaving Great Misery Island at 9:00. The first thing upon leaving the anchorage cove, I did a calibration of the new tiller-pilot and adjusted it to near perfect with my steering compass. I plugged it into the new wiring harness and plug Raymarine had provided along with the new unit on Friday – but the tiller-pilot shut down on its own twice yesterday as well. I used it all day otherwise with no problems. My plan was to sail north around Cape Ann then across to Newburyport by early-evening if not sooner, but with the wind from the N at 5-10, I made little headway and did a lot of tacking for what little I could eke out. Recognizing that just getting around Cape Ann could take me all day in itself before the wind shifted to the east as predicted, at 1:30 pm, I decided to go into Gloucester Harbor and cut off Cape Ann via the Annisquam River. Two bridge raisings and a motor up the winding channel let me out in Ipswich Bay at 3:00 pm with Newburyport Harbor about nine miles off. Once out of the river, I found not only had the wind changed directions – it had completely died. After another hour of attempted sailing, I fired up the outboard again; about an hour later I took down the sails completely: they were only slowing me down if anything. I arrived at the mouth of the Merrimack River at 7:00 pm and radioed the harbormaster looking for a slip or mooring for the night. He told me I wouldn’t be in for another couple hours and to call back again later. I thought he had to be crazy to think it’d take that long to reach the harbor not more than three miles upriver – but I should have known he’d know what he was talking about. Approaching the breakwater the turbulence was obvious. This entrance has a well-deserved reputation of being treacherous, though I’d never been through it before. Every year there are news reports of its casualties so I recognized that it’d likely be a challenge – and was it ever, living up to its reputation. When I later contacted the harbormaster (or harbor patrol, as the harbormaster seems to have bankers hours, going home a noon; call him there! 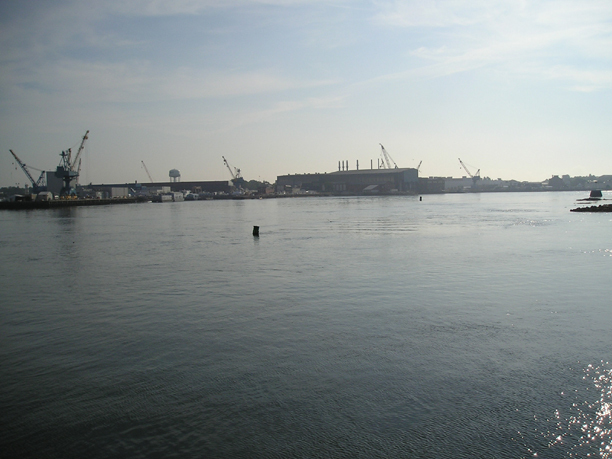 ), I was told to come to the city dock when I arrived and take any empty slip, or one of the city moorings (marked NBPT). When I asked how to find the dock, I was told “it’s the one all lit up on your port side.” When I finally managed to approach the harbor three hours later, traveling at maybe half a knot against the river’s powerful current, I checked the fuel tank and found it almost empty! I did a quick tank switch to my spare 6 gallon tank (during which I lost ground drifting back out with the current). Once in the harbor, I found everything was lit up, everything looked like it could be the city dock, and the current made exploring difficult at best. Spotting rows of moored boats across the river from Newburyport, I found an empty mooring and grabbed it for the night. After straightening out the boat, putting away the spotlight, flashlight and all the other equipment I’d needed to get in, I called Barbara, had a sandwich, and collapsed onto my bunk. (I awoke once to check my surroundings and all was well, I was still where I was supposed to be.) Before I fell asleep I heard the rain start to fall. Today it’s still raining. I need to refill a gas tank, get ice and some other supplies, and figure out when the best time is to leave with this current and the tide – or I could again wind up going through another six gallons of gas just getting out to the ocean three hours later. If the rain doesn’t let up soon, I’ll probably try again for a slip at the city dock and spend the day. A nice day of shore leave yesterday after I got squared away with a slip here: I needed a shower and some supplies and the city dock provides no shower facilities. After temporarily grabbing a city mooring for an hour or so, I walked up and down the river finally finding an empty slip. It’s heritage week here in Newburyport and everything’s crowded, slips reserved in advance, so I was lucky to get squeezed onto a face dock at Newburyport Harbor Marina. A very well-maintained and appointed marina, and its operators, Jan and Linda, couldn’t be more hospitable. They even provided me a ride out to the store yesterday (it would have been a long walk, especially carrying my provisions back!) I got ice and filled the gas tank I’d emptied. It was confirmed yesterday that I was running against a 4-5 knot current coming up the river Wednesday night. I called Brad Barrows yesterday after getting settled. He drove over and we went out to dinner across the river. Good seeing him again (he and I partnered on the Even Song and Idle Hours II back in the late ‘70s) and he got a chance to look over Chip Ahoy. In an hour I’m off again on my way north. It’s partly cloudy with winds NE at 10-15. The current is roaring out with low tide at about 10:00 am, so I’ll be running out with it – and from watching other boats heading out, it’ll be a fast ride to the mouth of the river. The plan was to leave here this morning, but I waited too late and the current made it impossible. I’ll leave tomorrow at slack tide, about 6:00 am, and ride this powerful Piscataqua River current out. I spent a couple hours of this downtime today rewiring the tiller-pilot, using the new harness and plug Raymarine provided: it worked all day yesterday and the original is still working intermittently, or should I say not working properly. Yesterday morning I left Newburyport Harbor at 9:15 am and flew to the mouth of the river in about half an hour riding the current out. It was hard to believe it was the same channel it took me three hours to enter against the current. Outside I again found very light wind from the north. After tacking about three miles in the same number of hours, again I started up the outboard, eventually dropped sail, and played 9.9 hp motorboat with a stick all the way to Portsmouth. Entering the harbor I caught the current right and rode it in for a free ride at about three knots. I’d called ahead and made arrangements to grab any open slip at Prescott Park Dock – fortunately located just before the first of three bridges coming into the harbor, because by the time of my arrival the current was picking up and I had to cross it just ahead of the first bridge. Also fortunately for me, another sailboat owner (the only person anywhere in sight) saw me coming and was ready with a hand to help get me into my slip. It could have been an event without his assist with my lines. Terry Coyle, a local sailor with a Barvaria 25, just invited me aboard for lunch (another basic sailor serving ham & cheese sandwiches, which has become my staple diet for the last two days). He advised that I wait until tomorrow to take my leave, hitting the current just before it changes to outgoing at about 6:00 am, and that’s my plan. Last night I walked around tourist Portsmouth, picked up a few supplies and had a great spagetti & meatballs dinner at The Rosa. From my slip I had a front row “drive-in theater” view of a great “arts festival” performance in Prescott Park attended by a horde of spectators. While trying to add a few waypoints to a new route this morning (and adding a BlueChart chart for Kennebunkport that somehow didn’t get uploaded to the GPS) the laptop battery just died, with about a one minute warning – in the middle of the upload. I finally found a way to connect to shore power (the plug for my slip didn’t work last night, there was nobody around to question, so I just gave it up), hooking up to a neighboring slip’s outlet with my extension cord that was just long enough to reach. The laptop’s been charging now for hours, up to 86% charged. Though this slip is on the inside, the dock is itself is right alongside the channel and it’s quite rough here: sometimes you can blame passing boats (and huge freighters, tankers and tows) for the rollers that pound the boats into their slips, other times there is seemingly no explanation for the violence. Tomorrow I’ll be shooting for Portland, Maine. Winds are supposed to switch from the still-northerly to W then SW, at long last. I left Portsmouth yesterday at dawn (5:45 am) with the tide almost full, still incoming. I got Chip Ahoy away from the dock, across the relatively mild current, out of Portsmouth Harbor, and out to sea by 6:45, greeted by a NE wind at 5-10 and set sail for points north. Once past the harbor entrance buoy the breeze picked up as I tacked north so I reefed the main and genoa for a while (good practice: everything worked just fine) and was on my way toward one very long day. I spent Saturday at the dock in Portsmouth after realizing I’d waited too late to attempt fighting the current. I had the motor running and was ready to slip my dock lines as a power boat crossed the current toward the dock, and I watched as he rapidly slid sideways with the current while giving the boat lots of power. There was no way I was going to pull that off with my 9.9 hp outboard – and to fail would sweep me onto the nearby rocks. I was too late, so decided to spend the day right where I was. I had work to the boat that could be done, so set about it. I removed the old tiller-pilot plug and wiring and replaced them with the new equipment Raymarine had provided, as it seemed to be more reliable (though the tiller-pilot still shut down on its own a few times even with the power hooked up directly to the battery with clips). Working on the crowded little boat is a real hassle: to get to anything (like tools and electrical supplies and equipment) requires major rearranging of all my stuff piled over all the cushions and lockers. With that done, I attempted uploading a few more BlueChart charts I’d overlooked, but right in the middle of the upload to the new GPSMAP 76CS, the laptop’s battery died. Uh oh, because the first thing Mapsource, the Garmin software package, does is erase all current charts before uploading. My worst fears were realized; all the charts were gone. I then worked on the shore power box and got it working, ran my extension cord to it, and started recharging the laptop so I could upload later. I had dinner at an Irish pub, Jack Quigley’s Tavern; a great shepard’s pie and a few glasses of Bass Ale, got back to the boat, and tried uploading the charts from a now fully-charged laptop. Everything went fine until the final step – when I was told I didn’t have the proper unlock codes for the GPS unit! Though I planned an early night as I was to get underway at dawn, I wrestled with uploading charts until almost midnight – finally giving up, accepting that I’d have to call Garmin and find out what’s screwed up with their stuff. Fortunately, I hadn’t gotten to trying to update my backup handheld GPS: it still contained the charts I’d originally loaded before departing Marblehead. Yesterday, weather reports called for the winds to shift from the N to the SW at 10-15 in the afternoon, but they shifted to the SE at a good 15, maybe 20. I made good time up the coast though the seas began to build to 3-4 feet and more by late afternoon. I finally reefed at about 3:00 pm and still was making a good 4-5 knots. I decided I wouldn’t make Portland before nightfall (that would have taken me over 20 miles more up) so decided to find a place for the night along the Saco River, either Biddeford on one side or Saco on the other. 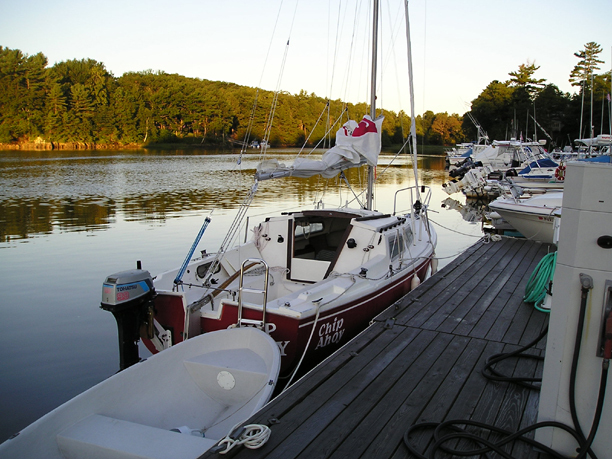 I called around, reached Marston’s Marina in Saco, finally was able to reach Randy, and arranged for a mooring there. Soon after, the squall struck. I saw the ominous black cloud approaching from over land, its sheets of rain slashing down diagonally, and it appeared to be heading in my direction. I dropped the main, left up just enough roller-furled genoa to act as a storm jib, and started the motor. By the time I’d donned my foul-weather gear and safety harness the storm cell was very near, the rain had begun. I stowed everything nonessential below and closed up the cabin, just as the squall struck, the deluge poured down. My last good waypoint before turning into the entrance for Saco Bay was coming up – and I had no good GPS route or waypoints for going into Saco. The sea buoy I was shooting for was quickly lost to sight along with land, my chartbook quickly became soaked. I took a fast compass read and did some on-the-spot dead reckoning from my saturated chart and at the buoy made my turn blindly toward where I thought the marker for the river’s jetty entrance was supposed to be. Fortunately I still had some three miles before reaching it, and after a mile or two the rain stopped, the sun returned, a rainbow appeared astern, visibility cleared, and my bearing proved to be pretty accurate, off by maybe five degrees once I spotted some of the entrance markers. 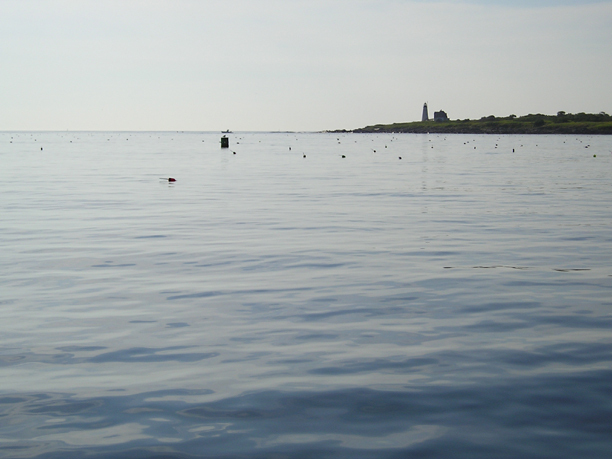 Protected by Wood Island, Saco Bay calmed and once inside the jetty and on the Saco River, the water flattened. The decompression attitude was tangible. From nasty squall to small serene river winding through the woods of Maine, it was like being transported into another dimension, another time. I slowed the outboard to barely above idle, popped open a Harpoon’s, and felt the tension quickly slip away. About three miles up this idyllic river I found Marston’s Marina. Randy had called me back as I was coming up to it and told me I could tie up to the gas dock for the night when I arrived, so soon I was squared away at it and greeted by Randy. He told me this is a very informal place, pointed out the unlocked men’s room and showers, and charged me dockage of $1/foot a night, $22 for Chip Ahoy. I’ve got electric too, and today they’re going to find a slip for me for another night. When he learned I’d come up from Marblehead (“In that little boat?”) and my plans, he wanted to hear all about it. I opened a couple more Harpoon’s and invited him aboard (as far as the cockpit: the cabin looked like a bomb had gone off in it). I’ll spend today here. I’ve got to call Garmin and get the charts uploaded into the GPS, and I want to rearrange the tiller-pilot wiring again. Yesterday I noticed that it seemed to shut down more frequently when the motor was started or running. I’m beginning to think the problem is on my end: something to do with its power source being interrupted. It worked better when I was using the new wiring harness as a backup, wired directly to the battery with alligator clips, so I’m going to wire the power leads directly to the battery and see if that helps. There’s nothing around here, nothing. I’m on a river in the Maine woods, more like a camp. The nearest town, Saco, is a few miles away, but Randy told me there’s always someone around who’d be willing to give me a lift into it if I need supplies or anything. Priority One today, when I’m done with my coffee and this writing, is a shower. Then I’ll get to work on the boat. Garmin as usual was great. I needed a separate set of unlock codes for the new 76CS, they said, and provided them. It took another call (and the interminable time on hold) to get it working, using the marina owner’s phone with my hardware connected in his office, but in the end it worked. I’ve got my BlueCharts back on my 76CS! The marina didn’t have an available slip so moved me out onto a mooring, but the first mooring had a serious problem when I tried to grab it: the pennant was completely wrapped and knotted around the mooring line and anchor. I grabbed enough purchase to loop something off on a bow cleat and hold on until a dockhand came out, looked over the situation, attempted to untangle the mess, and finally sent me on to a second mooring. This one was little better. I’ve got one of my dock lines tied off to it as a last resort backup. I hardwired the tiller-pilot to Battery One. Now I’ll see if that makes any difference. If not, I’ll next hardwire it to Battery Two and see what happens. Raymarine should be paying me for this! Afterward, I dinghied in and finally got my shower. Soon I’m going to need to visit a laundromat; I’m now down to one change of clothes. It looks like a good day ahead to reach Portland: about 15 miles to its harbor entrance once I get out the river and to the sea buoy beyond Wood Island. Winds are supposed to be light and variable this morning but turn south at 10-15 this afternoon, 15-20 later this evening when a small craft advisory may be issued as seas grow to five feet. I intend to leave with the tide this morning, dropping this mooring at 7:30. There’s a nasty thunderstorm going on out there but I’m buttoned up inside with the hatch closed and the coffee made (the alcohol stove and simmering pot pulled in from the cockpit just as the first rain fell). Yesterday I left Saco at 6:45 am and hoisted sail out in Saco Bay by 7:30. The wind was light, maybe four or five knots until about 11:00, when it picked up to 10-15 from the south for the rest of the day. I reached South Portland, some 18-20 miles covered, by 5:00 pm. The GPSMap 76CS went buggy on me from the start, its pointer spinning around 360 degrees, its compass doing the same. 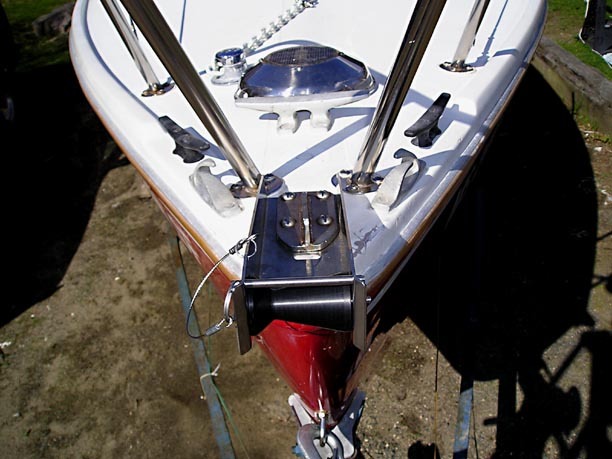 Once I got the sails up and was on a slow (making about one-and-a-half knots) tack, I called Garmin on the cell phone, was on hold for forty minutes, finally reached a technician and, try as he could, the best he could do was advise me to send it in for repair! I explained where I was, what I was doing, how I bought it just for this trip: he was sorry for my inconvenience, but the best he could do was give me an RMA number to authorize the repair. I hung up without another word: Garmin had wasted enough of my time and phone bill. That’s why I brought along a backup, my trusty older 76S. I brought it out, hooked it up to its old cigarette lighter plug, and ran the two units side by side all day, the 76CS for its charts and color, the 76S for its accuracy. Strangely, as the day wore on the 76CS became more accurate, the spinning pointer slowed then stopped spinning, and its headings were tracking the 76S, the steering compass, and the tiller-pilot readings pretty closely if not on the money. Another piece of high tech top-shelf electronics bought for this trip that I can’t depend on! The tiller-pilot remains a mystery. The problem seems to be connected to the motor running. I wired it directly to Battery One on Monday, and switched over to Battery Two for everything else, isolating the tiller-pilot to its own power source. I thought that would do the trick, but was disappointed again. On the way out the Saco River under power, the unit kept shutting itself off again – but once under sail with the motor off, the rest of the day it did a yeoman’s job of steering the boat without shutting down even once. But when I pulled into Portland Harbor and began looking for the marina I’d made arrangements with, starting the motor and dropping sails, it was back to its bad tricks. The wind really picked up as I was entering the inlet to the marina, docking was a bit of a challenge – especially when at the last moment they switched me from the face dock to the slip immediately inside just as I was edging up to the dock. I had to do a quick and totally unexpected U-turn maneuver around the end of the dock and into the outside slip, but the kid at the dock who was directing me did a good job of helping me in. Though he missed the bow line hanging off the bow, I was able to toss it to him from the cockpit. That’s a new little trick I’ve learned for docking singlehanded, especially when there’s nobody at the dock ready to give a hand. I run the bow line (the longer of the three dock lines, that I intended to be my spring line) from the anchor cleat on the center of my deck through an anchor line chock/fairlead at the bow, then outside the pulpit and lifeline stanchions, leave a little drooping there, and run the rest back to the cockpit outside the shrouds and lifeline. 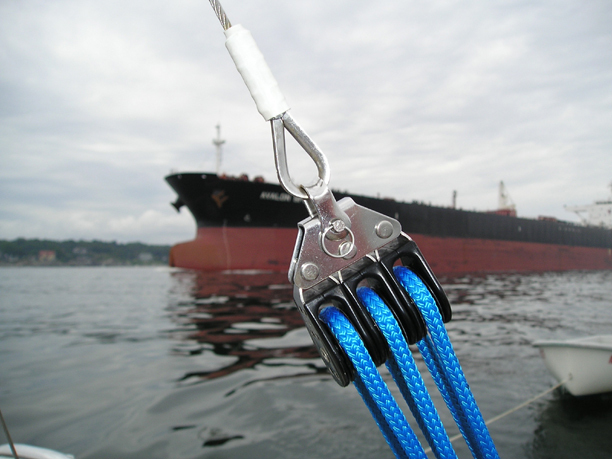 Then I throw a couple turns around the winch so it's ready to grab. I have the stern line cleated and ready to go, fenders hanging. It works well, as long as you know which side you’ll be coming in on. If there’s nobody at the dock to lend a hand, I just shift the motor into neutral, step off with both lines, cleat one depending on conditions, then the other. This marina is big and pretty nice: four individual nongender-designated bathrooms with showers, a laundromat in the same building, all the basics available at the office (ice, snacks, beverages, etc. ), and restaurant. After getting settled in and hooked up to shore power, I wandered up to the restaurant and had a disappointing meal. 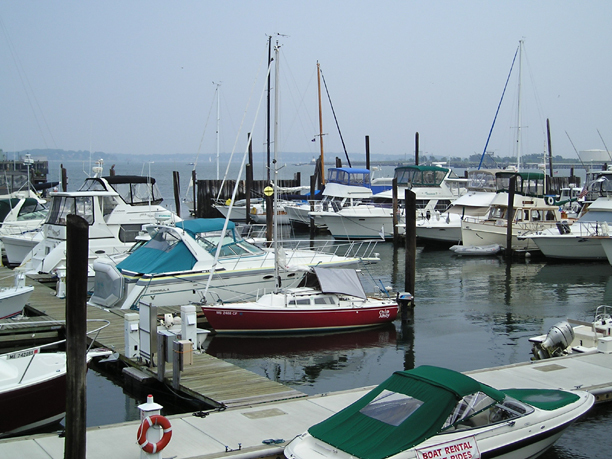 While waiting for a table, another couple told me I’d picked the wrong marina if I wanted anything more than this one itself provides; I wanted to dock in Portland, not South Portland, they advised. “All the action,” the businesses, stores and shops, restaurants were on the other side of this inlet. They recommended Demillo’s Marina on the other side, and I may check it out later this morning and move over to it if they have space. I’m paid for two days here ($34/day with electric) and expect they’ll refund a day if I decide to move on. Today I plan to plot more waypoints into the GPSs from the laptop (keeping my fingers crossed!) and add to my route, do my laundry (I’m down to one change of clothes), and take a shower. I plotted my course only as far north as Portland, intending to spend two days here and planning to add more waypoints during my layover, and here I am. Now if I can just get settled somewhere that has access to more than this “company town” I’ll be happy. After the nasty thunderstorm passed this morning, I got on the cell phone and called the recommended DiMillo’s Marina across the harbor: they had a slip and at 11:00 I was out of Port Harbor Marina, a day’s dockage refunded. Getting out of that slip was a challenge with the wind blowing hard from my stern in a congested marina, but with some help on the lines from a couple of new sailing friends I motored out in reverse then swung forward hard and fast past the other boats and dock into the channel. Outside the marina the harbor was rough and choppy, the wind blowing strong. I found DeMillo’s Marina easily enough and once inside their breakwater the conditions calmed more than I’d thought possible. It’s a comparative paradise here. It’s more expensive ($70 compared to last night’s $34), but the marina is located in the heart of “Old Port” Portland and much is within walking distance (I’m told; haven’t gotten out yet to see for myself). I got caught up on the necessities – shower, laundry, plotting my course for the next leg, filling the alcohol stove that ran out of fuel this morning after I brought it and my coffee percolator inside just in advance of the storm. I put the tarp up over the boom, solving the problem of the lazy jacks being in the way by simply lowering them. I’ve got ice, a six-pack of “The Shipyard Export Ale” brewed in Portland, shore power; everything’s recharging and I’m ready to take a walk out into “Old Port” for dinner. My original plan was to make it to Portland, take a couple or three days off here, then plot my course for whatever time’s still available. My next destination, it turns out, will be Bailey’s Island, just south of Orr’s Island in Casco Bay – but I’m taking tomorrow off for a complete day of R&R. There’s supposed to be a yacht club there (Merriconeag Yachting Association) where I should be able to pick up a free mooring for the night. The following day I intend to set off for Boothbay Harbor – where my old 1926 Alden schooner was built by the Hodgkin Brothers Shipyard, still in business. I’d like to take a walk-around of their operation since I’ll be there. I expect that this will be my most northerly (actually at this point, easterly) destination in my cruise; that I’ll turn around and start heading back after Boothbay Harbor. Rain is falling again this morning, but today I’ve got the tarp tented over the boom, covering the hatch and almost half the cockpit, so at least I can have the cabin open and the coffee percolating outside. What a great job it’s doing, what a difference from yesterday morning’s discomfort, steamy almost-claustrophobia. It appears that I’m just going to have to get used to rain and bailing out the dinghy. Bonnie and Charley may see to that. Both hurricanes are moving in on Florida and their effects are supposed arrive here beginning tomorrow and last through Sunday if Charley tracks northeast this way too. Weather reports are calling for fog, cloudy and occasional showers and thunderstorms today; rain with sometimes heavy downpours and thunderstorms for tomorrow as Bonnie pushes through. I called Monica yesterday and told her I’d only be making it as far as Boothbay Harbor, and she warned me about the approaching hurricanes, which will probably be downgraded to tropical storms by the time they arrive. She’s worried that I can get caught in one of them; she and Rich are going to get me more information on the Internet and call back today. She congratulated me for getting this far, for being someone who is actually living out his dreams. Portland may be the end of the route for me after all. If I can stay here through tomorrow I think I will, then begin the trek back to Marblehead and home. Last night I finally got out and walked around “Old Port” Portland, having dinner at Gilbert’s Chowder House, and bought my first newspaper since leaving to see if the rest of the world is still revolving out there. Today is dedicated to R&R with nothing planned – but watching the weather and trying to decide what to do with it. Sometimes wonders never cease. After the downpour ended at about 9:30 this morning I made arrangements with the marina to stay another two days, until Saturday morning. Yesterday, when I asked about the possibility, they told me I’d have to check back this morning to see if they’d still have space. I walked to Hamilton Marine (supplies) hoping to find a new glass chimney for my Weems & Plath oil-lamp with little expectation of actual success. (I bumped and broke the new one in the tight quarters almost immediately.) There’s also a West Marine, but it’s a few miles across town and I wasn’t about to walk that distance – but was prepared to call them and find out if they had one if I struck out at Hamilton then take a taxi over. At Hamilton, there it was on the shelf – the only one they had or I’d have bought two they're so fragile, and the woman at the check-out counter told me they didn’t even know they had it in stock; it didn’t show up on their computer. Had I called ahead first, I wouldn’t have found it. NOAA weather is still calling for nasty on tomorrow, “tropical downpours” as the remnants of Hurricane Bonnie sweeps by us. Today a small craft advisory has been issued for the coast of central Maine. A 40 percent chance of rain under mostly cloudy skies with the threat of showers and thunderstorms later today, winds SE at 10-15 in patchy fog; seas 3-5’. For tomorrow (Friday), NOAA’s calling for cloudy and rain, 70 percent chance, winds SE 15-20, seas 4-6’ in tropical downpours, visibility under a mile. Saturday things seem to improve. Partly cloudy with winds W 10-15 but seas 5’-8’ subsiding to 3-5’. I’ll have to hug closer to the coast, whether I head NE or S. Either way, once I reach the head of Cape Elizabeth there’s not a lot of coast to hug for a while. By Saturday night the seas should subside to 2-4’. Sunday is supposed to be mostly cloudy, turning partly cloudy in the evening. There’s a 40 percent chance of rain during the day, dropping to 30 percent in the evening. The wind is supposed to turn NE at 10-15 with 2-4’ seas. The remnants of Charley are supposed to pass by to the NE. I just checked out shipping lobsters to Hobie and, as I expected, nothing’s going to Florida today – and then I got hit with sticker-shock! It’s $4.95/pound for the crustaceans ... but $70 to ship them, bringing the cost to over a hundred bucks for five lobsters!!! Monday is supposed to be mostly sunny with winds starting from the N but turning NE with 2-4’ seas. Tuesday and Wednesday should be mostly sunny too. Boy did it ever rain last night! I awoke at 5:30 am, put on my foul weather gear, and bailed out the dinghy that was half-filled with water, the most I’ve ever seen in it. The rain has let up and I’ve got a pot of coffee brewing, but the cloud overcast remains and probably will through the day. I walked around town a little yesterday afternoon, had lunch at the Drydock Restaurant, and mailed out a few postcards. When I returned to the marina I discovered that it was like Marblehead homecoming week here in my corner of DiMillo’s Marina. First “Ten,” a fifty-plus foot sailboat from Marblehead, had pulled into the slip right behind me. 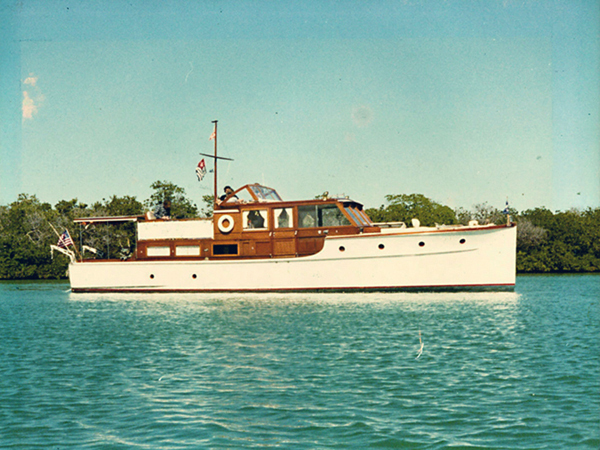 I met the owner, Bob Wilcox, and his wife Kim later in the afternoon and they invited me aboard for a drink. Bob’s got a neat set-up where his GPS displays on his laptop screen using software called Nobletec. They had a rough night sailing here from further up the coast and were heading home due to the weather forecast. We had an interesting discussion about the need to first know how to navigate before turning to electronics like a GPS and becoming dependent on them. I’d mentioned my little adventure heading to Saco and running into the nasty squall, how I didn’t have my GPS programmed with waypoints and a route beyond the sea buoy (I didn’t know I’d be stopping in or looking for Saco) when visibility dropped to less than a mile, how I grabbed a quick fix off the compass, mentally calculated a dead-reckoning course off my saturated chart and made my turn based on it at the buoy, and ended up darned close to my target when visibility returned. When all else fails, it’s essential to know how to navigate the old-fashioned way – and sooner or later all the bells and buzzers fail, usually when you need them the most and immediately. That’s why I bothered, paid to have my compass professionally adjusted before leaving Marblehead. Bob pointed out the big power boat in the slip right behind him, “Elizabeth M,” also from Marblehead, so when I left the Wilcoxes I strolled over and met it’s owner, Michael Mentuck and his crew of four, including Bill Cuzner who used to live across the street from us. They’re officials with the Boston Yacht Club and the club’s out on it annual cruise up the Maine coast. They got as far as Boothbay Harbor, heard the weather reports, and decided to turn back to Marblehead along with much of the fleet. Of course again I was invited aboard for a drink and to swap tales. I’ve decided to do the same, start heading back to Marblehead tomorrow morning. I’ve still got a long way to go in my small boat to get there and this weather has gotten to us all. The worst part is the conflicting weather reports, each source seeming to predict something different but nothing good. Is this Hurricane Bonnie’s “remnants” or another weather system perhaps affected by Bonnie, still down in Florida? Will Sunday be nasty as Hurricane Charley reportedly passes us to the west over land, or will it be a passably good day? There are reports predicting both, depending on the source. It’s extremely foggy here this morning, but the fog is burning off as I write. The “remnants” of tropical storm Bonnie were supposed to pass over us last night, as Hurricane Charley battered west and central Florida with 145 MPH winds, but for the first time since I reached Portland there was no rain overnight or in the early morning. The “tropical downpours” just never happened, though I was ready for them. I’ve got to check with the marina office this morning to see if they’ll have space for me until Monday morning: I’m #5 on their waiting list after I spoke with them yesterday afternoon and requested a couple more days here until Monday morning. Charley is supposed to pass over Georgia today then track NE off the southern New England coast on Sunday; we’re supposed to get those tropical downpours on Sunday into the night accompanied by 25 knot winds and 7-9’ seas. If I can’t stay here until then, this morning I’m going to run for Saco River and hope to tie up at Marston’s Marina again, sheltered up the river. The biggest difficulty I can foresee there will be is keeping the dinghy bailed out if I’m on one of their godawful tangled moorings. Yesterday was uneventful. I spent most of the dreary, overcast and drizzly day reading and napping, leaving the marina only for lunch (a bowl of great seafood chowder at Gilbert’s Chowder House). I bailed the dinghy dry before turning in for the night in expectation of the downpour: it’s still dry. I lucked out and not only is Chip Ahoy still at DeMillo’s, but I’m at my same slip and didn’t have to take down and rearrange everything. Things here at the marina were in major flux this morning due to the weather – lots of cancellations from boat-owners who intended to arrive but never left where they were, others who didn’t want to leave and go out into what was coming, like me. By 10:30 I was informed that I didn’t need to resort to my backup plan and make a run in five foot seas to the Saco River and hopefully Marston’s Marina. What a deceptive day it’s been: sunny, a nice westerly breeze around 15 knots, in the high 70s. Who’d ever suspect a tropical depression is heading this way tonight? But the cloud cover has begun to move in and the weather “experts” are calling for a major downpour and wind of anywhere from 35-50 MPH, depending on who you listen to, beginning tonight and running through tomorrow. For my major meal today I got a steak at the DeMillo’s Floating Restaurant, overlooking Chip Ahoy, while many of the marina’s boats were participating in a charity regatta and poker run. The marina really emptied for it by this afternoon. Light rain is falling as Charley, now downgraded to a tropical storm, passes over New England and moves out across the eastern Gulf of Maine later this afternoon and up into the Gulf of St. Lawrence. The rain is supposed to increase as the day goes on, but end by late afternoon. But the nice weather we were told would fill in behind Charley apparently now isn’t supposed to happen: tomorrow is going to be cloudy with scattered and occasional showers, Tuesday looks to be a little bit of an improvement, but the remainder of the week apparently is going to be more of the unsettled and overcast variety. This is getting very tiring, frustrating. It looks like it’s just going to have to be a wet trip home. To make matters even more frustrating, tomorrow the wind will be NE at 10-15, but beginning Tuesday and through the remainder of the week it will swing SW then S – meaning, just like the trip north, I’ll be sailing into head winds all the way again. As I told one of the Marbleheaders a few days ago, I’ll be surprised, pleasantly but surprised nonetheless, if I was to get anything other than head winds on this trip, regardless of my destination or its direction. This has been the trend, my perfect record, since my shakedown cruise down to Scituate (SW winds all the way) and back (NE winds all the way) three days later! This trip so far has been a challenge and has had its great moments, but overall so far I can’t say it’s been a whole lot of fun, it has been rather a disappointment in many ways. In retrospect, I think August was a poor choice: if I had it to do over, I’d have taken the month of July instead. But, of course, Maine was socked in by fog for most of June and July, so sometimes there just isn’t a good time. Perhaps it was the destination that needed reconsideration too. But then this has been one of the overall lousiest summers in history (though it rained most of last summer too), coldest summers on the books. At 8:45 it’s now pouring out. I thought cabin fever struck only in the winter. At least it’s dry and cozy in here and that tarp tent over the boom lets me keep the hatch open. Ah geez, will this weather never break? Today’s NOAA radio forecast calls for cloudy, rain often heavy at times, patchy fog during the day reducing visibility to less than one quarter mile later tonight. Winds are NE at 5 turning E in the afternoon. Seas are running 2-3’. It’s raining now. I’m ready to go – been looking forward to it since late yesterday and making ready – but do I want to go out into this slop today? Not only will conditions be miserable and difficult but, I’ve finally dried out the cabin, got rid of the worst of dampness thanks to the tarp tent. Once I take it down there’s no keeping it out of the cabin, even sailing with the hatch closed most of the time. Yesterday I walked back over to Hamilton Marine and picked up a cheap ($10) pair of Stearns bib overalls. I’ve got an expensive foul weather suit that I’ve found to be too bulky for comfort so have been using the old jacket with hood that Barbara gave me. The expensive jacket’s high stiff collar (with its useless nylon hood packed inside) won’t allow my sou’wester hat to hang over the back. I’m giving serious thought to staying here for another day, if that’s possible. Tomorrow’s supposed to be sunny, “a return to summer weather, if temporarily” NOAA is forecasting, though the winds are shifting to southerly. Of course they are: that’s where I’m heading! What other direction would they be coming from? A cold front will be moving in on Wednesday bringing along with it more “unsettled weather” through the weekend – though the chance of scattered showers and afternoon thunderstorms is only 30-40 percent, which beats today’s 70 percent. If I can squeeze another day at this marina I might as well. If not, I’ll move out and head for the Saco River. I don’t think the trip will be risky, only uncomfortable. Yesterday I plotted a lot of new waypoints and routes into the two GPSs; courses from various sea buoys along my route home into the ports I stopped at on the way up and a couple others – just in case I run into another unexpected near-zero-visibility situation. High tide here in Portland today is at 12:21 pm, which is pretty close to the tides along the coast on my route. Low tide is at 6:10 this evening. Heading home I want to hit those river currents just right this time if possible; just before low (ebb) tide going in, high (flood) tide coming out – or as near to it as I can. Saco River won’t be much of a problem; it’s current isn’t quite as bad as Portsmouth’s or Newburyport’s. The latter two are going to be tricky to time and may require leaving before dawn. I can hardly wait to be on my way. Portland and DeMillo’s Marina have been as good a place as any to be stuck, better than most in fact, but I’m beginning to feel like a hostage being held here. It’s time to move on and out and I’m more than ready. The rain shower has stopped: only the threat of more and heavier today is still holding me back. I escaped, broke out of Portland Maine at 10:00 am on Monday! I couldn’t take it any more and decided to get moving and hope for the best; by 9:00 am (decision time) the sky was overcast but there was no rain – though it was forecast for the day ahead. I put the foul weather gear within reach, tucked my chartbook into the new giant ziplock baggie I bought at Hamilton Marine, took down the pup tent over the boom and was on my way, freedom! On the way out, I was crossed by first one then two big tugboats. I noted that the huge oil tanker at the pipeline dock between Portland and South Portland had its stack smoking, probably readying to leave. I made a mental note to keep my eye on it. Then I got caught up with trying to navigate my way out of the harbor. Whoooom, the deep loud horn blasted behind me, I spun around, and there she was – one big tanker bearing down on me! I had plenty of water beneath me (75 feet or so), so I cut hard to port and let it pass. Awesome to say the least, a skyscraper of steel moving through Portland Harbor’s shipping channel right alongside. Once outside approaching the sea buoy, I futilely hoisted sail and attempted do what Chip Ahoy was designed to do, to no avail. “Light and variable” was nothing and unrelenting. Back to playing motor boat with a mast for the rest of the day. Aiming for Saco, I did a little corner-cutting from my route in flat, oily seas, heading in a more direct approach under motor, closer ashore. The effects of the hurricanes manifested themselves in a Sargossa Sea of churned-up kelp and seaweed everywhere, floating masses of it. I had one encounter with something huge just beneath the surface (a whale perhaps) and off to my starboard, but nothing materialized – just that surface effect. I arrived at Marston’s Marina at 6:00 pm, timing the Saco River current perfectly, as well as the closing of their fuel dock. Before I escaped from Portland, I’d called ahead to let them know I was coming and ascertain I had a place to stay. They’d told me I could grab the same mooring I had last time. I asked if they’d untangled the mooring line yet. They told me I could have the same mooring I had last time! I decided I wanted the gas dock again if I could finesse it when I arrived. I knew they closed at 6:00 pm and dead low tide was at 7:00, when I hoped to be docked. I told them I’d need gas upon arrival. I arrived a 6:00 pm sharp (more luck than skill, but I did work toward it), was welcomed back, got my 6 gallon tank filled, bought a quart of 2-stroke oil I didn’t need, and Brian told me, “You might as well spend the night at the fuel dock, if you want.” Yeah! My new buddy Randy Randall, hearing I was in, showed up and the two of us set up the cockpit “pup tent” as the rain finally began to fall. He and I sat under it and had a couple of Shipyard Export Ales (made in Portland) I’d brought along, told stories and swatted mosquitoes or just ignored them. Yesterday I was up before sunrise readying to cast off. Just as soon as it was light enough to sight the markers I was prepared to go, heading again for Portsmouth, NH. I was out of ice (should have thought about that when I bought gas and oil!) but I wasn’t about to let that hold up the day’s plan. Just before I was about to depart, another boater came down and asked if I had any “Mercruiser two-stroke oil.” I had three quarts of Havoline, but he wanted Mercruiser. Then I remembered I’d bought a quart from the marina the night before and used only half, and sure enough, it was Mercruiser. I offered to give it to him (sell it, he insisted), commiserating that the office was closed until 9:00 am, that I needed ice I’d have to forgo. He had extra ice, so we traded my oil for his bag of ice! You do have to love the way things work out sometimes. Once out of the peaceful Saco River and out to the sea buoy I hoisted sail in a brisk NE breeze – that lasted all of 15 minutes or so before going “light and variable” again, and finally south. The “motor boat with a mast” persevered as the 2 foot head seas became extremely short and choppy as the day wore on. Again I cut corners, heading for Portsmouth in time for slack tide against a 10-15 knot wind from the south. Off Kennebunkport this time the surface disturbance produced a whale, which surfaced about 30 yards off my aft starboard beam, the second time just 20 yards directly off my beam. When I collected my thoughts and grabbed the camera, it’d disappeared. Quite an experience seeing a beast of the sea that’s considerably bigger than your boat up that close and personal. I just hoped it wasn’t in a desperately romantic mood! It was really rough in that chop, spray blowing over the cockpit all day. I did a quick gas tank switch just before approaching Portsmouth, a drill at which I’m getting very efficient thanks to necessity. I had to remove my glasses finally; the salt made visibility impossible and cleaning them non-stop. Old Chip Ahoy took a pretty good pounding yesterday and performed well. Wish I could say the same for the tiller-pilot, which keeps shutting down for no known reason and usually when I most need it. I had Don over for coffee this morning, after drinking a few of Skip’s beers and vodka last night aboard their boat (I contributed my pint of tequila). Skip and Don are going to fill my emptied gas tank while running around looking for steering parts. They just came back with a bag of ice, knowing I was intent this morning on getting some. After I told them about finding the chimney for my oil-lamp at Hamilton Marine in Portland, they called and found the steering parts they need up there and are driving up to get them. Probably another “party” here tonight as they’ll likely stay to fix their boat. As Barbara said, I needed a day off from my vacation for a little R&R! I plan to be on my way tomorrow morning at about 8:30 with the slightly outgoing current just after the tide turns. Next stop, the Merrimack River and Newburyport – then home a day later. Ah, the best laid plans, good intentions and all that sometimes go along the wayside. I’m now trapped in Portsmouth until tomorrow (Sunday) morning. Thursday morning there was so much fog over the river that I put off my departure until it lifted (more or less), but by then the current was running too strongly. Oh well, another day in Portsmouth I thought, as I shut down the motor, unpacked the “pup tent” and rehung it over the boom, pulled the dinghy back to the dock in front of Chip Ahoy, retied my dock lines, and unpacked down below. I went out to lunch at Jack Quigley’s Tavern with Don and Skip then spent the rest of the day reading and napping while they continued work on rebuilding their boat’s steering. (At least the cost of a day at this dock is only $25 – much more affordable than the $70-plus/day I paid at DeMillo’s in Portland, though no showers or other amenities are available here.) Again last night we partied on Skip’s boat. Friday morning was a replay of Thursday. The fog was lifting, Chip Ahoy was ready to cast off with an iffy weather forecast, but just before starting the motor I discovered I had only about two gallons of gas in the reserve tank I’d switched on Wednesday. 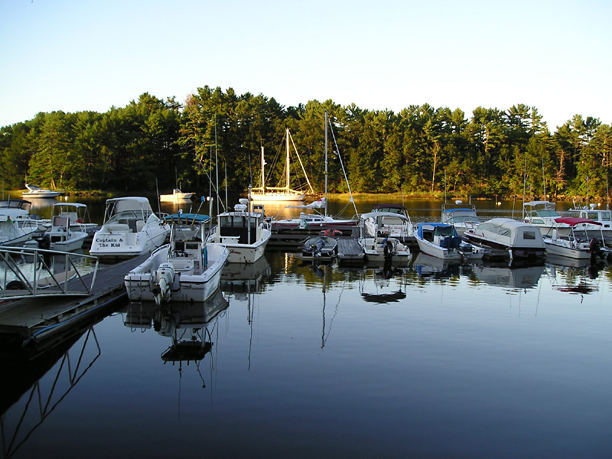 While Skip and Don had taken my empty tank out to a gas station and had it refilled, I was concerned that I might need the additional fuel once I headed up the Merrimack River if I missed hitting that current just right – as I did there coming north when I had to do a quick tank switch at night. Skip and Don had just run out to find more rudder and steering parts; upon their return Skip drove me to a gas station across the river where I filled my second tank with another four gallons. These constant southerly winds are devouring gas – I still can’t believe how much I used on Wednesday. I should have checked both tanks when I got in, I just never imagined the second tank could be almost empty too! I’m lucky I hit this river in near tide slack coming in. 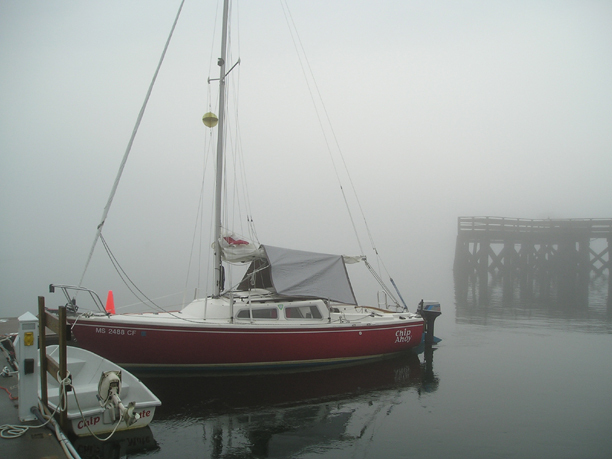 By the time we got back to the dock, the Piscataqua River current again had become too strong, the fog was persisting though thinning. Again, I unpacked, re-covered the boom with the tent, moved and tied the dinghy back onto the dock and put off my departure another day. It’s intriguing how sometimes bad luck can turn into the best in the end. A couple hours later, Skip and Don had their steering system repaired and decided to take the boat out for a shakedown, drive it down the river to Little Harbor Marina and fuel up. They were gone for only half an hour and were back with fog horror stories. They couldn’t make it even around the river bend a mile or so down river. When they first saw the fog ahead they thought it’d thin as they entered it, but it only became worse, “a wall of dense fog” they reported. We then watched other boats moving down the river, returning too. I’d have had to fight the outgoing current had I left and had to turn back. I was finally able to find and take a shower. The dockmaster (I call him The Ghost as he was never visible but the bill for dockage would appear in the cockpit each morning; he enjoys my nickname for him) and his assistant told me there were public showers about a half mile away on Pierce Island over the fixed bridge above the fishing fleet harbor, at a City of Portsmouth-owned swimming pool, public recreation area, and boat launching ramp. The two young attendants there didn’t charge me the $2 pool fee just for a shower; the young ladies didn’t think it would be fair since I wasn’t going to use the huge pool. They also must have known all that was available was cold water showers, invigorating to say the least but I left clean at last and certainly refreshed. Soon after my return to Chip Ahoy my unexpected extended stay here became even more provident. In the early afternoon NOAA and the National Weather Service issued grave “severe thunderstorm warnings” and a small craft advisory. “Golf ball size hail,” winds gusting to 69 MPH, and downpours reducing visibility to a quarter-mile or less in rain and fog. They were warning mariners to head directly to port if they saw dark clouds coming in their direction. The severe weather warning was to remain in effect until 7:00 pm. They weren’t exaggerating. The storm system blanketed most of southern New England, from New York over Connecticut, Massachusetts and southern/central New Hampshire. It arrived over Portsmouth around 3:00 pm with a vengeance and lasted until just about 7:00. It turned out to be but the first line of thunderstorms: the second, which arrived at about 10:00 pm, was even more spectacularly awesome. It awoke me with its flashes in the distance as the second storm moved in over us; at first I didn’t immediately recognize it was lightning, thought it was something going on in the city, maybe fireworks. Then it moved at us and the thunder began to roll. I have never witnessed such a display of literally non-stop lightning, like flash bulbs going off at a news conference, a machine-gun firefight, one following another in split seconds, if not simultaneous all around, from all directions. Incredible fury, then the wind began to howl. My little “pup tent” over the boom held up throughout, thanks I believe to the bungie cords I use to secure it, allowing it to flex in the high winds. This went on until after 11:00 pm, as NOAA continued tracking it and issuing dire warnings. Fortunately I’d bailed out the dinghy after the first storm as we were supposed to get an inch to an inch and a half more rain during that ferocious hour. Bailing it out again will be my first order of business at dawn. We’re in some sort of tropical weather disturbance or pattern (related still to the hurricanes?) that’s blanketed the northeast with damp, humid tropical air – which is causing all this fog – and is expected to last through today, along with more showers and thunderstorms. I knew yesterday that if I stayed here another day it’d be for two days, as the weather is supposed to stay nasty until a new area of high pressure and dry air push into the region overnight tonight. Wind is supposed to be out of the SW again today with seas running 4-6’ – 10’ further out. Sunday and Monday are supposed to clear out this weather: clear, sunny, dry, winds from the NE shifting E and seas subsiding to 2-4’ or lower. We’re taking a bit of pounding here at the dock whenever one of the work boats passes and its wake comes rolling against the floating docks and slips. It’s startling to see the cement dock lift above Chip Ahoy’s windows and the detonations of boat hitting dock can at times almost rattle my bones. If I’m below in the cabin I just hang on. It gets so rough on the dock that it’s all you can do to stand still and struggle for balance, watch the mast roll in a frenzy. I’ve put out all four of my fenders, retied my dock lines a couple times trying for some kind of improvement (the two bow lines running port and starboard seem to help somewhat), and am considering lowering the swing keel dockside to keep it from pounding beneath the hull. Watching the fishfinder last night, I believe I’ve got enough water for it even at dead low tide, though I was initially warned by the dockmaster of shallow water. I’m just not sure whether that’d be an improvement or not, whether it’ll cause more or less wear on the keel hanger and pin. I may find out later today. The fog is so thick I can just make out the end of the dock: there’s nothing visible out on the river but fog. Another severe thunderstorm, unceasing lightning and thunders, torrential downpour and wind, rolled over again at about 4:30 am and lasted almost an hour. Again NOAA had issued severe thunderstorm warnings for 4:00-5:00 am with the powerful storm cell moving right for us. These thunderstorms are like nothing I’ve ever experienced, and Portsmouth seems to be the epicenter. More “chance of thunderstorms mostly this morning” according to NOAA weather, and nothing but those, pretty much persistent rain and “patchy fog” for the rest of today. I got out onto the dock just before it hit and bailed out the dinghy again. It needs another good bailing as soon as this rain lets up. We’ve had over 2 inches fall since last night, NOAA just reported: seems to me that I’ve bailed out more than that. The first boat has moved from the dock, apparently a fisherman who didn’t make it around the corner to the small fishing fleet harbor in the fog and storms last night and holed up here instead. He’s not going much further in this fog and rain anyway. But even his slow passing rocked my boat, so I’ve lowered the keel to see how the boat responds. I’ve got 12 feet of water beneath me according to the fishfinder and need 5, but the tide’s going out. I should have enough come low tide in a couple hours, but I’m ready to crank it up if need be. It’s sure been quite a vacation, very different from my anticipation, unfortunately timed with hurricanes, severe thunderstorms, rain and fog, the wind too often coming from the wrong direction, far too much motoring and gas consumption, and much more time spent in ports where I intended to stop only briefly along my way to new horizons. I’ve probably now spent as much if not more time hunkered down in the cabin beneath the “pup tent” as out in the cockpit underway. Even my tan is fading, a sure indicator of extended adversity. Having the keel lowered has made a significant improvement with the wake action against the dock, and there was plenty of water beneath it even at dead low tide, some 8 feet. It’s still pretty rocky aboard but much better than yesterday. We’re still getting heavy scattered and occasional showers and the fog remains pretty dense. The darkening sky to my northwest seems a harbinger for more thunderstorms soon. Low tide this morning in Portsmouth Harbor according to NOAA radio was at 9:30 am, high tide at 3:50 pm, but we had that strong outgoing current until about 10:30 am with it finally slackening around 11:00-11:30, almost two hours later. It’s since begun to come back in. It’s hard to adequately describe the power and quirkiness of this reportedly 8 knot current in relation to the tide. If I could get out of here before the tide turns supposedly at just after 4:00 tomorrow morning I could get a quick ride out with it and into Newburyport, some 23 nms out into the ocean and down the coast, earlier. But getting across that current and into the channel in this small boat with my 9.9 hp outboard is awfully risky until it slackens. I’ll be ready to go by 5:00 and wait it out until I think I can make it across and out – but from my close observations this morning, that won’t be until 6:00 am or so. I just plotted my course from Newburyport to my mooring in Salem Harbor using the laptop and uploading to the two GPSs. 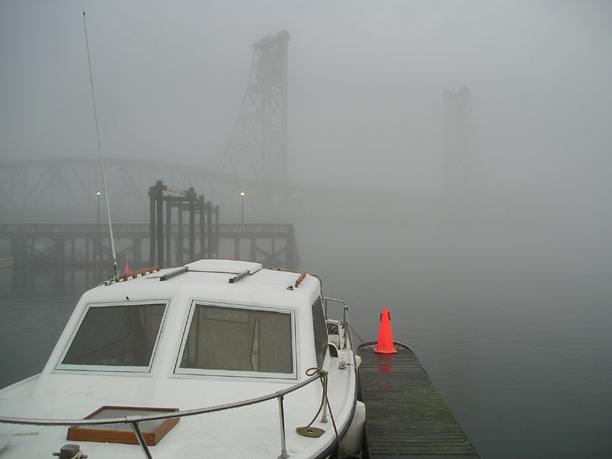 Barbara told me last night that there was a big news report in the Salem News about local boaters who needed to be rescued in the fog the other day, a real mess she told me. I think I can pretty much cruise blind if need be now, but the weather is supposed to improve dramatically over tonight and at least for the next couple of days. I wish I could make it home in one long run, avoid the Merrimack River entirely, but it’s just too much distance ahead, over 40 nms from here to Marblehead. It’s simply a two-day trip from here, no way around it. Barring unforeseen circumstances – and why would I expect to be able to accomplish that with any confidence? – I should be back on my mooring and home by Monday late afternoon. Downpours and thunderstorms commenced this afternoon at around 2:30 and haven’t let up yet. I hear thunder in the distance but the rain’s still coming down hard. Supposedly this will end by 7:00 pm and I can’t wait so I can walk into town and get a bite to eat at The Rosa: snacks, cashews and cokes are holding me over until the monsoons end. 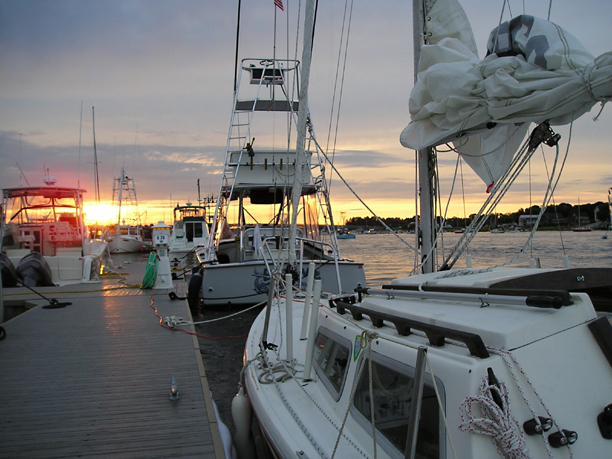 Whoa, another day and I’ll be home, back on my mooring in Salem Harbor! Last night the rain let up at about 6:00 pm, enough to hike myself over to The Rosa with foul weather jacket on and order a pizza and a beer. Then it was back to the boat, noting that the sky was clearing to our northwest. As I did earlier in the day, I made notes that evening on how the current was running in relation to NOAA’s high/low tide proclamations and decided that if I could get out just after the announced 4:16 am high tide by an hour and a half, I’d catch a slack and slightly outgoing tide. I made preparations and hit the sack by 8:00 pm for a predawn start. 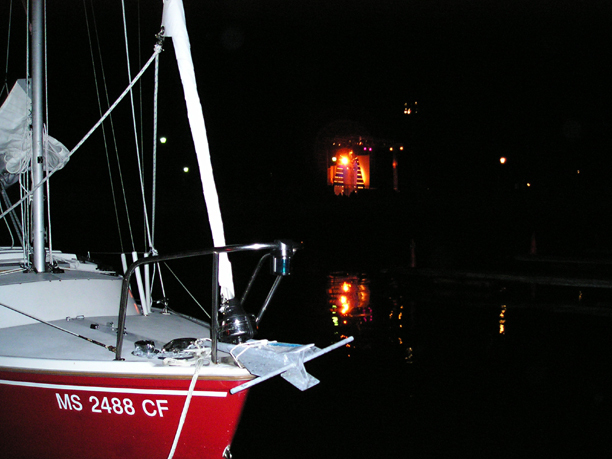 I was up and packing at 4:00 am, had the “pup tent” down, the dinghy back tied to the cockpit, the electrical cord and battery charger, the fenders and spring lines stowed, and was ready for the tide and the dawn. I lowered and started the outboard and ... something seemed very wrong. It was difficult starting and, once finally started, kept popping and banging. For the first time it stalled in idle. Uh oh, all I need in that current is the motor dying. It eventually flattened out, seemed to sound near-normal, and I had my current perfectly, so at 5:45 am I slipped the bow and stern line and powered out across the channel and out the river, turning on my running lights and powering up the lighting on the GPSs. Half an hour later at the mouth of the river with the sun rising in my eyes above a bank of clouds to my east, I noted a slight breeze from my northwest and hoisted the genoa, then the mainsail, heading for the markers off Rye then Hampton, NH and homeward bound. I had a steady 5 knot breeze from around 7:00 am until about noon, when it started to get variable and fickle again. After diddling around for an hour and beginning to lose my slack-to-incoming tide on the Merrimack River, I crossed my fingers and started the motor (it started pretty much right up), dropped sail, and motored to the Merrimack River entrance buoy about three miles in and slightly south. I hit the river tide just right – but I hadn’t conceived of the number of Merrimaniacs out on a weekend! It was bad enough dealing with the most obnoxious, inconsiderate, ignoramuses on the water anywhere on the East Coast that I’ve cruised from Key West to now Portland, Maine, coming in against the current on a week night. On weekends their caretakers must let the inmates out of the asylum on unsupervised furlough and give them all boats for physical therapy! It’s impossible to describe the chaos – from small fishing boats and aluminum dinghies anchored in the mouth of the ripping entrance bouncing all over bejesus just attempting to catch fish, to the motor yachts in a major rush to get their important skippers somewhere fast for lunch; from the weekend-liberated worker-bees free at last and in a huge hurry to go nowhere fast, to the Cigarettes in a whole big rush to support Saudi oil sales – the inmates race hither and yon in a frenzy, from behind and abeam, coming at you, blasting up from behind on both sides. They are simply everywhere and all they have in common is “the faster the better”! Yeow, what a frigging zoo. I made it into Newburyport Harbor without being struck or worse, had made arrangements for a dock here, and just as I began to cut across the channel to my dock – up pops a fleet of kayaks if you can believe it, right between me and my dock in the current. Oh saints in heaven, does this craziness never end? Eventually I made it to the dock, a hand was waiting to help me tie up, and I’m settled in for the night. I’ve taken a shower (with cold and hot running water! ), filled the cooler with two bags of ice, hooked up the extension cord to shore power and plugged in the charger and laptop, had a beer or two (actually I just opened my third! ), and here I am, winding down and thinking about dinner soon. Oh yeah, and bouncing up and down on the face dock almost as rough as it was back in Portsmouth – but the keel is down and so it shall remain. I’ve been assured that once the weekend warriors are all back at their docks, moorings, and boat ramps that the river will calm down. When I spoke with the owners about the Merrimaniacs, they both concurred with my assessment and told me about all the boating disasters hereabouts every year especially near the mouth of the river, how there are too many boats run by too many owners without a clue about boating, rules or consideration, how the area holds a record for boating fatalities. Without a doubt, there being not even a second-place close finisher, this is the most dangerous place I’ve been through on this trip. I arrived home at my mooring this afternoon at about 2:30 pm after an early start this morning and at last a day of good wind and weather. The trip is over – now if I can just get the ground to stop rolling. I’ve got to admit, it’s good to be home – wow, my own bathroom with its own shower – with hot water on demand! Last night in Newburyport I walked up to the Starboard Galley for dinner (great fisherman’s chowder made from tomato base instead of the usual cream) then retired early, about 8:00 pm, so I’d be ready for another early start – the last leg home. Up at 4:30 am in the dark again, I began packing up the boat and getting ready to pull out with the tide and current – and before any of those Merrimaniacs could awaken and have another shot at me out on the river. As soon as it was light enough to see the markers I cast off and was on my way. The river was an entirely different place at 6:00 am; I saw maybe a dozen other boats on my way out to its mouth on the outgoing tide; all I had to concentrate on was riding that powerful current out, steering the boat where I wanted it to go and not where the current wanted to take me. I was met at the ocean with the usual big rollers where sea meets river current, but was soon over and past them and out to the entrance buoy, turning and heading south along the coast. Ahead, Cape Ann and Plum Island were only faintly discernable off in the distance, a layer of fog was out there across the ocean and between me and my destination. With the sun low on the eastern horizon, only beginning to peek over the cloud bank, I expected it would burn off soon – but I had plotted waypoints and a new route on the laptop and uploaded them into the two GPSs so thought I could find my way even if I ran into low or even zero visibility. The new course I’d plotted was a bit more inshore than when I came north, running between more sound buoys but only about 2-3 miles offshore, as opposed to the fewer buoys further out but in a more direct and somewhat shorter run. 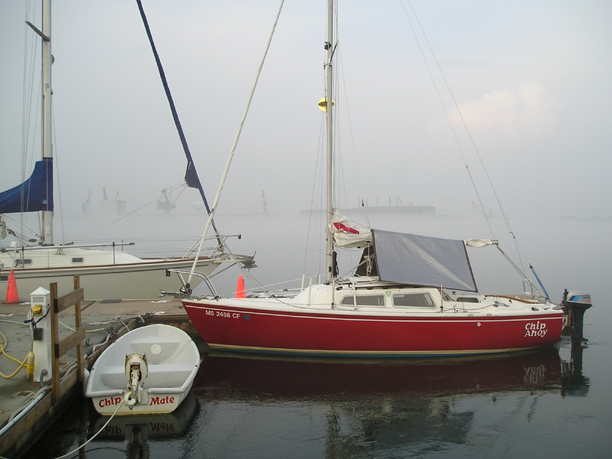 Within a couple hours the fog had dissipated and land was in sight ahead and to starboard, as expected. I had a good southwesterly wind at about 10 knots, so hoisted sail and breezed along making a good 4-5 knots all the way past Plum Island, into Ipswich Bay and almost to the Annisquam River entrance, where I started the motor and dropped sails. The narrow Annisquam River winds through marshes, sandy beaches and rocky coastline, cutting off the trip around Cape Ann. It can be a pleasant, leisurely passage or it can be very tricky, depending on the tide. Before I left Newburyport I’d asked around for information on which way the current runs with tide. (I seem to remember that being a tricky problem from my boating days two decades back.) Nobody seemed to know for sure, but the consensus was that it runs into Gloucester Harbor from Ipswich Bay on an outgoing tide. Wrong. When I arrived the river was almost dead low and the current was emptying at me, so the channel was even more extremely narrow and shallow. I had my swing keel almost fully retracted since approaching the river, so was startled when I felt and heard the first bump. Quickly looking at the fishfinder I saw that the depth had dropped from the 7-8’ down to 3’ with rocks about 12 feet to my port and a long sandbar reaching out for my starboard side. Even keeping closer to the markers didn’t help, for later I bumped bottom again while only a few feet from a nun. The railroad bridge was open when I arrived; the bridge at Route 127 that would take me out to Gloucester Harbor wasn’t. A huge motor yacht coming out of the nearby Cape Ann Marina was waiting for it ahead of me and, in that narrow canal at low tide, maneuvering in place was difficult, but it would have been worse had the current been running opposite instead, pushing us toward the bridge. After a wait of about ten minutes that seemed like an eternity, the bridge finally opened and we were out into the harbor, where I lowered the keel and headed toward Gloucester Point and the sea. There the water got quite rough and choppy. I motored into the ocean, where it got even rougher. The wind had picked up to at least 15 knots from the SW and NOAA radio was announcing that a small craft advisory was issued for later this afternoon and tonight. After a couple attempts, singlehanded I was unable to get the main up without broaching the short 2-3’ foot seas. (That damned useless tiller-pilot was taking another day off when I really needed it!) I was too close to home now to blow it, so left the motor running just above idle (to compensate for weather helm) and ran the remaining 10 miles or so home under only a slightly reefed genoa, still making between 3½ -4 knots all the way back. When I passed between Bakers Island and Great Misery Island I knew I was home and put away the charts, started clearing the cockpit and preparing to moor. Pulling into my anchorage seemed like I’d been away longer than three weeks, even finding my mooring took some hunting and searching – and it took me two runs at it to pick it up, only the second time that’s happened. For some reason, my mooring seemed to be closer to the boat nearest by, floating just alongside it. Once moored I let out a long sigh of relief then set about organizing the boat and packing the essentials I’d be taking home: electronics, the laptop, and a bag of bare essentials. I’ll deal with everything else tomorrow, bring Chip Ahoy to the dock and offload all the other stuff I apparently brought aboard in many dinghy trips over a period of a week or more. I called Barbara and told her I was in, home, back from the sea at last, and she headed down to pick me up. After I closed up the boat and loaded what was coming ashore with me into the dinghy, I dropped into it and was about to start its outboard when ... bang! I looked up and saw the nearby boat’s transom had just impacted with Chip Ahoy’s anchor and bow roller. I quickly scrambled back up aboard. There was no apparent damage to my boat, but the other boat appeared to have a ding in its transom. I got on the cell phone and called the mooring company. Rich told me he’d be right over from the other side of Marblehead and look over the situation, that he should be there in 20 minutes. I waited a while and watched the other boat swing and it didn’t threaten contact again in the next 15 minutes. With Rich on his way and me utterly exhausted and concerned with the valuable load still riding in the dinghy that was banging against Chip Ahoy in the wake of passing launches, and with Barbara waiting at the dock, I decided to leave the situation in his hands when he’d soon arrive, and I headed ashore. The first time I missed my mooring on the first try, that same boat had just acquired that mooring, and it was too close. Rich had to move one of us back then and everything was fine since ... until now. He arrived right after I left and moved my mooring away from the other boat a few yards and assures me all will now be all set again. He suspects someone with a bigger boat borrowed my mooring while I was gone and probably dragged it a bit, just enough to create the problem. It was an ironic ending to a three-week cruise of over 200 miles that was otherwise damage-free: it couldn’t have happened any closer to home. It was a great experience, though unlike what I’d expected. But had it been what I expected it wouldn’t have been the same challenge, more a test of endurance, patience, and perseverance than the straightforward sailing adventure I had anticipated. I’ve now cruised the entire eastern seaboard twice, from Key West, Florida up to Portland, Maine. I wish I could have gotten further Downeast, at least to Boothbay Harbor, but as they say, “Any port in a storm” and I sure had my share of storms and some pretty good ports to sit them out in. I met a lot of great new people along the way, both marina owners and operators and other boaters, and made some new friendships over the past three weeks. I was amazed when I got a call on the cell phone from Randy Randall of Marston’s Marina a few days after I left there, just checking to see how things were going and that I was alright! Once again I appreciated that natural camaraderie that we boaters instantly share upon introduction, that willingness to lend a hand, provide advice and share our experiences. I learned a lot of new tricks (eg., that perfect little “pup tent” and how to prepare to dock singlehanded), especially the need to plan ahead for entering and leaving rivers and their powerful currents – an entirely new experience. In all my coastal cruising two decades-plus ago, currents only affected us from the side: we never needed to noticeably take them head-on or following us. That’s a whole new factor I had to reckon with and learn to deal with, and the only solution for someone with a small outboard is to remember: “Timing is everything”! Most of the trip I was out 4-6 miles offshore and Chip Ahoy handled wonderfully for a 22-foot sailboat. For the most part (excepting yesterday coming out of Gloucester) I could handle it singlehanded, though it took most of my attention and concentration without the tiller-pilot. The boat took seas up to four feet well, even if a little wet in the choppiest. The Saco squall incident reinforced the absolute requirement of knowing traditional navigation before depending on a GPS or any electronics. While a GPS (and sometimes two of them) made the trip far easier than those of two decades ago. I was never more glad I had navigation under my belt to immediately fall back on in that short few minutes before the squall hit and blinded me. Anything less could have been disastrous, but I was pretty confident that I could ride it out. Everything mechanical on the boat worked fine: but you can’t trust electronics. A properly functioning tiller-pilot would have made the trip much more enjoyable – but I could never rely on my Raymarine. It never worked right during the entire cruise and became a major annoyance. I had quite a few caustic conversations with it over the three weeks, for all the good it did me. I just couldn’t hurt its feelings despite my best and frequent efforts. It will go back to Raymarine, and the new dysfunctional 76CS GPS will go back to Garmin, for repair in the next few days. Besides the spinning pointer and compass, the GPS began just locking up. The only way I could get it to work, the only way I could even shut it down in fact, was to unplug it, remove the back, and pull out a battery. Put everything back together and it’d start right up again and work fine sometimes for days – once I recalibrated the compass each time. I could always depend on the older 76S model. The Stearns chart cover, actually just a giant zip-lock Baggie some three feet by 26 inches, solved the problem of saturated charts and I’ve used it ever since, even under clear blue skies as it kept the pages from blowing over. As far as I can see, there is no solution to the problem of wet eye glasses and puddled GPS screens in a downpour except take off the glasses, keep wiping off the screen, and do the best you can given the circumstances. If I ever do something like this again, I’ll take Hobie Davidson’s advice and get a cover for the dinghy – in fact I might do that anyway next spring. Over the course of the trip I must have cumulatively emptied Chip Mate of rain at least twice, but it did well trailing behind on its 20’ tether even in the roughest seas, even with its outboard mounted the whole trip. Will I ever attempt a similar adventure again? That’s hard to say right now, until I get my land legs back, but my immediate response is probably not. Three weeks aboard a Catalina 22 is a challenge but not much different than I’d expected: it was like camping out, comfortably. I had to do this trip just to see if boat and I could handle it, pull it off, and together we did fine. Now I know that it can be done; I just don’t know if I’d want to do it all over again. Maybe I’d feel differently if the weather conditions were better, but they weren’t and there’s no reason to expect they would be during a next time out and off – though it’s hard to imagine them being any worse. But it was something I had to do, was compelled to attempt. It was another adventure, a new experience. I’m glad I did it. And I’m equally glad it’s successfully behind me and that I’m back home. I can relate to that, sort of. Rat and Mole were messing about in a boat on a river, not at sea. I’ve been canoeing on ponds, white-water rafting in California, and crewing on a small sailboat off the beach in Greece and Florida, where the water was warm when you fell in. These things are fun. 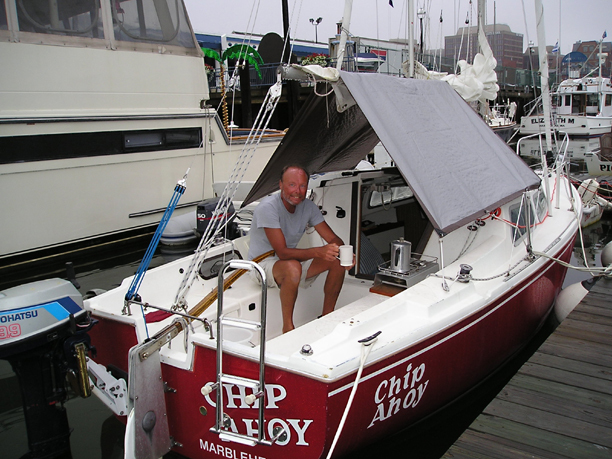 When Chip left for his vacation trip from Marblehead to Maine, he put his boat-list on my computer so I could relay questions he might have during his odyssey. Hobie, who lives in central Florida, was my main contact in case of trouble, but he got hit head-on by Hurricane Charley. When he had electricity again he sent the above information just as Chip was about to head back down the coast that Charley was about to travel up. And I thought, when it comes to boats and adventure, “just plain nuts” describes Chip pretty well. I don’t get it, really. I figure almost anything is better than being in a tiny boat with no real bathroom, that I can’t get off when I want, with a choice between being sick and dramamine-sleepy. My attitude didn’t change as Chip called me on his cell phone to report days of no wind, marinas without shower facilities, river currents rushing past rocks and docks, tides going the wrong way, faulty electrical equipment that he’d been counting on; mosquitos at dusk, red sky in the morning; rain and constant lightning all around him, and mad motorboaters with no consideration for small sailboats. This makes it even more clear to me that boats are generally a guy thing — and like other guy things, attract two basic types: the show-off speed-demons, and the skill-oriented life-huggers like Chip and his list-mates. Though of course some women sail. Chip described it somewhat differently, based on previous coastal journeys: That you are never more alive than when you are about to die in a storm at sea, with only your skill and determination to save you. Also, he is very goal-oriented, and was disappointed that wind and weather conditions wouldn’t let him go all the way up the coast of Maine. His list pals sent this message: “It’s not the destination, it’s the journey.” Which I guess I can relate to as an analogy for life. I think that when it comes to boats, and a lot of other things, some men are always teenagers, adventurers and pirates. I guess that’s what makes them so wonderful. Barbara Anderson of Marblehead is a regular contributor to Viewpoint. Readers who want to read Chip Ford’s journal about his sailing trip can find it at www.chipford.com. Boaters who launch from up-river into the Merrimack know the feeling: As they approach the end of the 5-mph "No Wake Zone" at the icebreaker just beyond downtown Newburyport, the throttle inches forward. As boats blast through the more open water, an obstacle course of anchored fishermen, kayaks and drifting boats bob dangerously as larger boats leave them literally in their wake. In an effort to make that area of the river more safe, harbormasters in Salisbury and Newburyport plan to create a new no-wake zone near the mouth of the Merrimack in the coming weeks. The zone, which requires boats to limit speeds to 5 mph, will be between buoy 8, near Ben Butler's Toothpick, and buoy 11, near Badgers Rocks, a well-known patch of rocks on the Salisbury side. 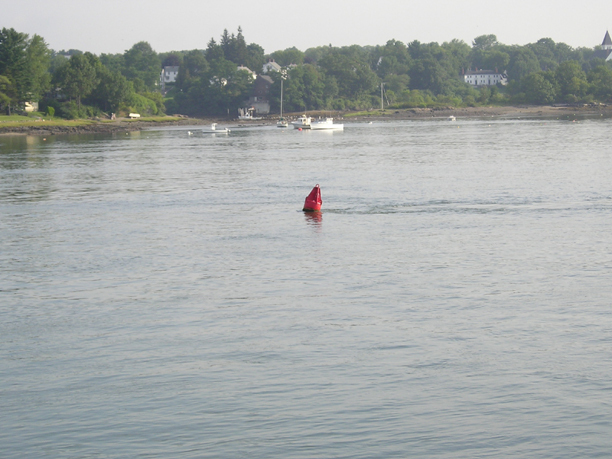 The new zone came about after the harbormasters in Newburyport, Amesbury and Salisbury met recently and decided that for the sake of safety the buoys should go in. The idea is to slow boaters as they motor by what's traditionally been a popular fishing spot, where many anglers anchor and cast or just drift with the current. "There have been some cases (this year) where people got swamped," said Ray Pike, Salisbury's harbormaster. "But a 16-footer doesn't belong out there either, so there's some responsibility on the boat owner. "It's the smaller boats that pay the price. Three Haverhill men were rescued in the mouth last week after their 16-foot boat capsized in just two- to three-foot swells, waves a large boat can easily produce. Most boaters are aware speed in the river is dangerous to other boaters, can damage docked and moored watercraft, and can result in pricey fines for offenders who get caught. But not everyone heeds it. "No-wake zones take you more time and I know people get frustrated, but they're important to the safety of the boats moored," said Andy Spellman, a Plum Islander who owns a 30-foot power boat and was bringing a friend's 18-footer into the water at Cashman Park Thursday. As it stands, the river has one no-wake zone that extends, with a few breaks in between, from the icebreaker in Newburyport up to about MacKenzies Marina in Amesbury. The so-called "back river," on the Salisbury side of Ram, Carr and Eagle Islands, does not have a no-wake zone. 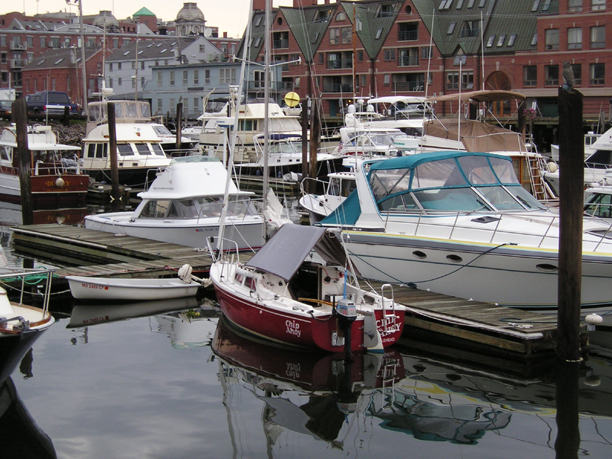 Harbormasters regularly warn boaters of the dangers of going too fast through that stretch because of substantial rocks in the river, and there are areas less than two feet deep at low tide. Several boat owners interviewed Thursday said they don't mind the long no-wake zones. Sometimes they're necessary. "Some of the guys with the bigger boats come through way too close and way too fast," said Mike Pickles of Pelham, N.H., who owns a 17-1/2 foot boat that he has been launching in Newburyport for two years. "If people would be more respectful it would be nice. It stinks that it has to come to this (putting in a no wake zone)." "I think they're required," said Ron Maglione of Peabody, who owns a 19-footer that he's been bringing here the past three years. "Some people are fools with their boats." "It's not that long a ride and it saves other boats," said Tom Baker, a boater from Marlboro. "It's crazy how fast some boaters go." Gary Balestrieri, co-owner of Plum Island Kayak, said the tours his company leads three times a day have sometimes had their boats rocked by the wakes of those going too fast. No one's ever tipped over to Balestrieri's knowledge, "but we've had some close calls," he said. "I'd say 90 percent of the boats are watching out for us and 10 percent of the less-experienced boaters really whip by," he said. But just because the no wake zones are marked doesn't mean boaters always adhere to them. Jackson Bailey, harbormaster for Amesbury, says he stops speeders in their boats on almost a daily basis. Fines start at $50 depending on the severity of the infraction and past offenses. Daily News Correspondent Alexander Christopher contributed to this report.